Tonight's patient: my Fender Jazzmaster. I'll be setting it up (it never has been) and doing some preventative maintenance, and I'll show you the process so you can do it too. Save yourself approximately $35 vs. having it done by a pro! I love to get my hands dirty. Some guitarists don't. They play for a while and then decide their guitar sounds like crap and they take it to a repair shop and pay someone to fix it. That's fine, but setting up and maintaining a guitar really isn't all that difficult, and it'll help you feel more of a connection to your guitar. It'll sound and feel the way you want it to. 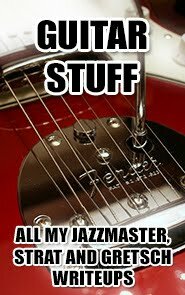 And if you can do it on a Jazzmaster, one of the most intricate instruments out there, then you can do it for any guitar. One of my most popular posts here has turned out to be my earlier Jazzmaster post, so it seems like there's plenty of interest in these guitars out on the interwebs. I basically followed Angel Romero's great Jaguar setup guide, now hosted at the Higher Evolution of Offset-Waist Guitars site. I didn't really get quite as precise as he does in the guide, but I don't think it's really necessary. When you're doing a setup for yourself, you just do it by feel. Also, make sure before doing any of this that you first do a tremolo setup using the excellent guide for it at the same site. This doesn't take very long, but you should do it first. One simple question that gets asked a lot in discussion forums is how you remove the Japanese tremolo arm. The simple answer is you just pull it out. It can be very tight and feel like it won't budge, but you just get some good leverage and make sure you're only pulling straight up and you just firmly (but gently) pull it out. After the first 2 or 3 times, it slides more easily. After removing the superficial hardware (including the bridge cover), it was time to do some neck work. I'd never removed the neck on this guitar before tonight, but my neck had developed a slight bow and I wanted to correct it. In addition, the extreme low humidity in this area at this time of year had sapped the moisture out of the fretboard and I wanted to remedy that. I also have been having a little trouble with the guitar staying in tune, and after someone suggested checking my nut, I discovered the strings were binding. This happens when the slots in the nut just aren't quite wide enough to accommodate the strings. A little digression: yeah, I'm dumb, I wasn't using a humidifier during this year's winter. I am now. That may have caused my slight neck bow, and it can cause other problems too. Make sure to maintain your humidity. I now have a hygrometer and a humidifier near my guitar. Time to remove the neck. I flipped the guitar over, being careful to buttress both the body and the neck with foam blocks that I salvaged from the box that my wife's new guitar shipped in. The last thing you want is to break the pickup switch off or something while unscrewing the neck. Of course, you can always just buy a guitar work stand, but I don't think it's strictly necessary unless you plan on doing a lot of work on a regular basis. 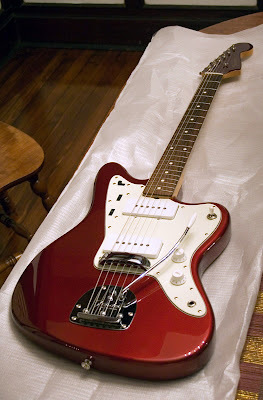 And there it is, the CIJ Jazzmaster neck. No neck stamp like the American version, just a JM-66 model number near the heel. I was surprised at how easily the neck popped out. It didn't stick to the body; if I hadn't been holding it, it would have fallen right out of the neck pocket. That made it pretty easy; older necks that haven't been removed in a lot of years can stick and mar the finish if you yank it out the wrong way. No shims! Most Jazzmasters have at least one to maintain the correct neck angle; it's normal for a Jazzmaster. Mine has none. Doesn't need one, I guess. The first thing I did was a truss rod adjustment; just a quarter-turn to tighten and get rid of that bow. I didn't want to go further than that, and that is the recommended increment. If you need more, you can always do more later. But a quarter turn is supposed to be enough in most cases, and it was in mine. You won't really want to go further anyway; you can really feel that rod pushing against the wood as you turn it, and there's a certain point where you say "ok, no more." The second thing I did was file the nut. I just gently filed the sides of the slots a tiny bit with a metal emery board, making sure not to file downward and also trying my best not to overdo it. I figured I can always file more if I need to, but if I go too far and need a new nut... well, that's probably beyond my ability right now. Some say it's unnecessary, others say it's actually harmful (they're flat wrong), still others swear by it. I'm in the last camp. The people who say it's harmful have confused two different products. There's lemon oil furniture polish, as in the photo above, and there's lemon (or orange) oil cleaner. The cleaner is a mild solvent - it's citric acid, it will eat your guitar's wood for breakfast. The furniture polish actually has no lemon or citrus in it at all. It's really mineral oil with a mild lemon scent (hence "lemon oil"). It's probably the best thing possible to use on unfinished wood. This is the stuff Queen Elizabeth's staff uses to refresh and maintain the antique wood furniture in Buckingham Palace. I always say that if it's good enough for her, it's probably good enough for your guitar. Those who say it's unnecessary are probably right in certain environments. But I live in an area of extreme humidity swings. Humidity drops under 20% in winter and stays there. Even with a humidifier, I'm probably not going to be able to keep the humidity at really optimal levels all the time. If you're like me, you're gonna need to oil your fretboard to keep the frets from popping out and to avoid other problems (like a bowed neck). Some people swear by olive oil, and I dunno, it might work. (Probably smells, though.) But lemon oil is really, really good for wood. I use it on all sorts of things, and have for years. After the neck work, it was time to screw the neck back on, re-string and tune up - I made sure to keep my bridge straight as I did so. I've learned from experience that it's easy to let the Jazzmaster's floating bridge fall backwards when re-stringing, and that makes for massive bridge saddle buzz. Then I let the guitar sit for about an hour to re-set, and then I tuned again. It's at this point that you should check that your neck really is straight, using a straight-edge or the string itself as mentioned in the setup guide. I just did it visually, looking down the neck from the bridge. There's obviously a compromise required in action height. Too low and you will fret out. The Jazzmaster's not really intended as a shredder guitar, so you're never gonna be able to get your strings pressed right up against the frets (well, not if you want to actually play it). I got mine pretty low, though, and I only get some occasionally slight buzz on low E on certain higher frets. I'll see if I can live with it; if not, it's simple to just raise it up slightly. By the way, you should technically lower your pickups if you're lowering your strings. For me, I don't notice much difference with the strings lowered by a millimeter or so, so I didn't bother. I also am planning to replace my pickups within the next couple weeks, so I'll deal with pickup height at that point. Now for intonation - time to make the guitar sound good! Ok, for the beginners looking here for info on their new guitars: intonation is how well your guitar stays in tune all the way up and down the neck. It's kinda pointless for your guitar to be in tune on open strings but not when you're actually playing notes somewhere else on the neck. So this is really important. Adjusting intonation can be kind of a long, laborious, annoying process. It's simple (the process is described in the guide), but there's just a lot of back and forth checking and re-checking and adjusting and re-adjusting, because to a certain extent the strings are interactive with each other and the tunings need to be absolutely perfect. You can't just do one string and call it done, you have to assume that any other adjustments you make will affect that string and go back and re-check them all again afterwards. And you have to do it multiple times. My intonation was atrocious when I first checked it, as I kinda suspected from playing it that it would be. It took me about 45 minutes of checking tunings and moving bridge saddles back and forth before all of my strings were in tune both open and at the 12th fret. But when I got it, holy crap! It's a huge difference. It's the difference between sounding like a beginning amateur and sounding like a pro. Seriously. It really is amazing how much better a guitar can feel and sound after a proper setup. And now that I've done some neck adjustments, it really doesn't seem so scary to me. Most setups won't even require adjustments like that, so really anybody can do this. It just requires a little time and patience, but not much skill. If you've never set up your guitar or had it done for you, do it and do it yourself! Still got the plastic on the pickups. Yep, the Gibson-Fender war has infiltrated our home! We plan on having a nightly wrestling match until a winner emerges. It's actually an Epiphone Les Paul Standard - Epiphone being Gibson's low-cost brand these days. It's her first guitar, so it seemed a little strange spending $2,500 on a Gibson. Maybe someday. It's actually a really nice guitar for $400. I've always been a Fender guy - I like the full-range single-coil pickups, and specifically the dark tone of the Jazzmaster, and I like that you can easily take the neck off and adjust it or replace it and do all sorts of other things to the guitar yourself. And Fenders are tough, you can beat them up and they still work. Supposedly, Pete Townsend used to play a Strat on stage specifically so he could break it in one of his famous fits of rock rage at the end of a show, put it back together the next day, and then do the same thing again. Try that with a Les Paul! But I gotta admit, this thing is pretty sweet for the price. It sounds like a Les Paul - fat and thick, which is why people who like Les Pauls like Les Pauls. I actually like the slightly thicker neck a little better than my Jazzmaster - I have really big hands. (Surprisingly, my wife likes it better too even with small hands.) And I'm totally jealous of the bound body and neck. I wanted a bound neck on my Jazzmaster but it was about $130 more and I couldn't justify that for a purely cosmetic thing. But you basically get it free on the Les Paul Standard. The new Epiphone Les Paul Standards are made from real mahogany, not plywood like the older ones (and maybe still the cheaper ones), and they've got Grover tuners and Alnico humbuckers. Being a Fender guy, I really couldn't even tell you what separates an Epiphone from a Gibson. This is a well-made guitar. More importantly, my wife's happy with it. She wanted that Les Paul sound and she got it. Took her a while to decide on a color, but now she's happy with black. It just seems to suit the look of the guitar. Here she is playing it! I've talked about the Brooklyn Brewery before; they've pretty quickly become my favorite beer label in the United States. One thing I always thought was a little annoying about them, though, was their name. It's kind of a lie. All of their mass production is done in Utica. When they print "brewed in New York" on their bottles, they're technically correct, but I'm sure "New York" to most people means the city, not the state. Especially when "Brooklyn" is the name on the bottle. I don't really blame them, though; their Brooklyn brewery (yeah, there is one) just doesn't have much capacity. They produce limited editions and draft beers there and that's about it. Well, here's a real Brooklyn-brewed Brooklyn beer. It's fairly new, and it's not a limited edition. (At least not that I know of.) One of my wife's friends gave it to us as a little gift; I don't know where we can actually buy it around here. Well, outside the brewery, that is. This is Brooklyn Local 1. Not for nothing, it comes in a Champagne bottle. This is basically a Belgian style "strong pale ale", though it doesn't taste quite like any I've ever had before and the brewery claims it's really got its own style. It pours deceptively light, cloudy like a Belgian beer should be, and with a pure white head. Its aroma is pretty immediate; very floral. Looking at it, I imagined something sweet and crisp and watery. I love a beer that makes me go "hooooooooo!" after my first taste. I wasn't expecting to get hit so hard. It's not overpowering or heavy like an Imperial Stout - don't get me wrong - but it's pretty much a taste explosion. It's got an everything-but-the-kitchen-sink kinda thing going on, but not in a bad way. Nothing really seems out of place. There's tons of citrus, florals, coriander and hops going on. It's very peppery. They've somehow managed to make it both bitter and sweet at the same time - I've really never experienced that in a beer before. And yes, being a strong beer, you can taste a little of the alcohol - though it's not unpleasant in context, like a good wine. One thing that's amazing about this beer is that it's naturally carbonated. It's old-school. Supposedly, they don't even make beer this way in Belgium itself anymore. I've seen reports that "very little" CO2 is added - I'm not sure what that means, but the majority of the carbonation comes from warm room fermentation. That might explain some of the complexity and seemingly impossible flavor combinations that you just don't find in other beers. You will get drunk from a 750ml bottle of this beer, no doubt. That's a pretty big bottle, and it's 9% alcohol. And you will enjoy every sip getting there. Look for this stuff. It's worth it. What city has the largest Japanese population living outside Japan? Go ahead, look it up. Use Google. What'd you come up with? Sao Paolo, Brazil? Wrong. This is an internet myth that, like a lot of myths, has a grain of truth to it. But that grain of truth has been twisted and misunderstood. Even the official stat is larger than Sao Paolo's, though. In fact, in all of Brazil, there are only about 83,000 Japanese-born residents, which is dwarfed by the number in the United States (officially over 400,000). 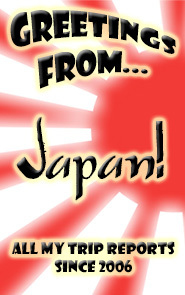 Where the myth probably comes from is the number of Japanese descendants in Brazil. Japanese emigration to Brazil has been pretty long-standing, and it's a community that never fully assimilated into the rest of the country - they've married and had children mostly with their ethnic brethren. So there are literally millions of ethnic Japanese Brazilians. But they are Brazilians, not Japanese - the same way a US-born person of Japanese descent is an American. You wouldn't call such a person "a Japanese person living outside of Japan". That'd almost be a little racist. Anyway, just wanted to clear that up. It came up in a discussion I was having today, and I was pretty annoyed when I looked it up and saw how often this myth is repeated in the top Google search results (including Wikipedia).